25 September 2016 Dehydrating onions. 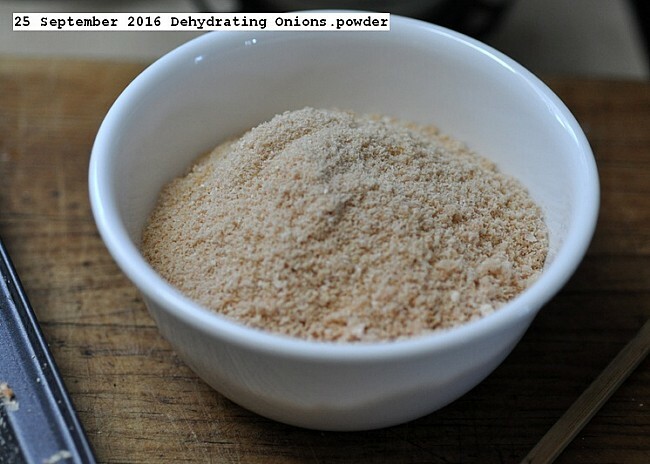 http://durgan.org/2016/September%202016/25%20September%202016%20Dehydrating%20onions./HTML/ 25 September 2016 Dehydrating onions. Experimenting with dehydrating vegetables. This is my effort in dehydrating onions. Two large onions were made into a slurry with a hand blender and dehydrated at 135F until dry about 8 hours. Slurry as opposed to cutting into small pieces saves labour and the end result is essentially the same. Some of the end product was vacuum packed for long term storage practically indefinitely. Some was placed in a covered bowl for current use kept in the refrigerator. Dried vegetables is a storage method, advantages are small volume, and they retain most of their nutrients. This entry was posted in Uncategorized and tagged 25 September 2016 Dehydrating onions., Dehydrating onions.. Bookmark the permalink.